The Pere Marquette was the first post war American RR to run fully streamlined passenger equipment. Was purchased by the C&O, now part of the CSX. 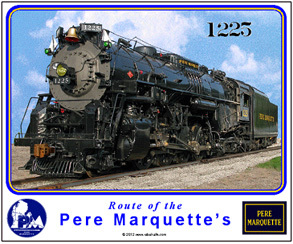 The Pere Marquette Railroads famous No. 1225 steam locomotive is featured on this beautiful 11oz coffee mug. PM logos are on the reverse. Mouse pad features the Pere Marquette Railroads famous No. 1225 4-8-4 steam locomotive made famous by the Polar Express Movie. She is restored and operating in Owosso, MI. 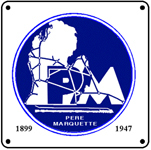 6 inch x 6 inch square tin sign of a logo used by the Pere Marquette Railroad. 6 inch x 6 inch square tin sign of a logo used by the Flint & Pere Marquette RR and Steam Ship Company. A very unusual logo used around 1892. 6 inch x 6 inch square tin logo sign of the Pere Marquette Railroad. 6 inch x 6 inch square tin logo sign of a drumhead used by the Pere Marquette Railroad on its Resort Special passenger train.